The best games out there are also some of the more traditional ones – particularly for those of us of a certain age. In the old-fashioned pubs and bars, the one-armed bandits used to be hugely popular in Canada, the UK, Australia and other countries that formed a part of the old British Empire. If you’re familiar with these old machines of yesteryear, you’ll know that they have a magic all of their own. The pulling of the arm, and the need to yank it slightly beyond the point of resistance, or sometimes to have to start over, was all part of that magic. This was a real physical act; no soft button pushing or clicking of a mouse, you really had to pull that one armed bandit’s long metal stick with the round ball on the end. Then there was the magical sound of the pile of coins being dispensed into the metal pay-out tray at the front base of the machines. The coins would simply come whooshing down with a satisfying sound of lots of metal pieces on a steel background; nothing quite like it! Of course, there’s nothing quite like this today. Even retro pubs and bars don’t have genuine, old-fashioned one armed bandits anymore, and if they do, you can be sure you won’t be allowed to use them for fear of breaking the things. The fact is that these old timers fetch a huge price on the second-hand / antiques market. Some of the better online games providers, however, realise there’s a big market for this kind of nostalgia. 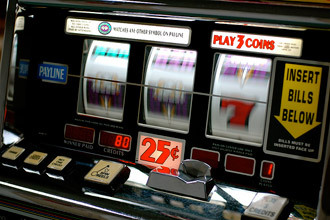 You can find the games at ca.32red.com, for example, in the fruit machines section of the site that come close to replicating the sights and sounds of the old fashioned gaming machines. These really are “reel” pub classics. What’s more, you even get an introductory bonus of $32 for each $20 deposited, so you can be playing for free for a while if you play your cards right. You may also play the games simply in demonstration mode to get a feel for them – or simply continue to play in this way if you just want to try and re-create the feel of the old-fashioned machines. If you want to go a step further and buy a real one, though, then you’d better be prepared for a bit of a shock and have deep pockets! A really nice old machine in good order will cost you somewhere in the region of $2,000-8,000 depending on the quality of the machine, and its collectability etc. You can buy cheaper models, of course, and/or replicas if you just want a little fun. But if you’re looking to buy a seriously collectable antique model, then it’s wise to seek advice from an expert in the field before you part with your cash.